I've spent some time on your website...AWESOME collection! =8-O . . . O*M*F*G*! . . . at least I still have a couple Old World goodies that you don't, heh! You've yet to live the life ThinkClassic until you've built the ultimate 1994 TV/Media/Rudimentary TeleConferencing/HomeWorkStation on the revolutionary Quadra 630. I'm eagerly awaiting pics and an explanation of that lil' puppy on AppleFool. I did have a Quadra 630 back in the early 2000s. It had the tuner card in it and the candy bar remote. I used it with a 15" multi sync as a my bedroom TV set. When I got divorced, it went to the recyclers along with most of the other "old" computers I had at the time. I'm sorry for your loss, my friend. I've still got all the various parts from the rug rat's bedroom setup . . . including the first gen TV/Tuner System's credit card remote, AppleDesign Speakers and the Q630's components. I used its 6360 replacement (another classic you've yet to nab) and the trusty 21" Radius CRT as my VHS/DVD screen until 5 years ago when I bought a multiple input, 32" 720p Wide Screen. It's still my PDF server with the kiddo's 17" Sony Trinitron in the HackStation. It'll be doing VHS/DVD serving alongside on a 12" RGB's innards as the desktop display as well when I finally get around to finishing up the Lisa2 Prototype AIO case for it. That was/is an amazing computer in both NuBus and PCI iterations. Great photography of that most impressive collection on your web site, mcd. I need to get back on taking photographs. I was just thinking about that today. 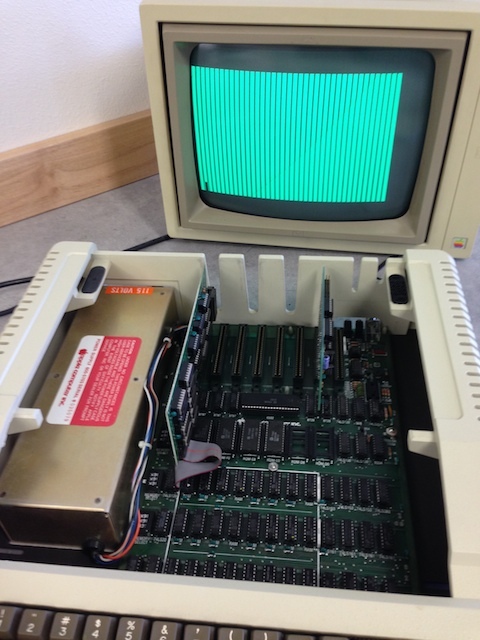 It turned out the 2513 character generator chip had been swapped for a newer Apple 341-0036 ROM instead. The old, integer ROMs did not like that monkey business at all. I tested it with the proper 2513 from my early ][+ and all was well so the replacement should be here next week and "PHIL" the Apple ][ will be finished up. I have to give out a big thanks to volvo242gt and macdrone for helping me source a few parts for it! We'll he has a 6400 so he doesn't need the 6360 I'm thinking. LOL! I doesn't count until you've done a 12" PCI VidCard in Quadra 630(60) series case hack . . .
. . . oh wait! You're the guy who mostly de-hacks his Macs! Those InstaTower things are just cow-pied (first rev. Ford Taurus'd) Dell Cases . . . The actual Dell cases are on the Umax SuperMac S900. I had a PII Dell at work that used the exact same case with a different front bezel. Have you seen the inside a 6400 and 6500 that case is crazy. Like the performa desktops released at the same time it's like a puzzle taking it apart. Found a little dumpster 5400/120 but it's missing the logic board and rear bezel. I popped in the LB from a 6400/180 and the rest of it is working well enough. I have a 5400 board as I put a 6300 board in mine. It was one of the ones sitting inside the for when you walked in. Want me to bring it when I come down? It's another couple of weeks correct? Well, my Lisa 2/10 arrived today. It's widget drive is loaded with Macworks XL. I'd like to take it back to Lisa Office System which should be doable. Now to start reading everything I can about this beast. It's certainly not a Mac. Ya when I turn on my Apples, it takes me a minute to remember how to do anything. At least you have a head start. I've never even used an Apple II of any kind.